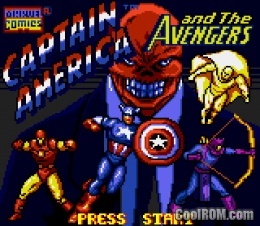 Captain America and the Avengers is a retro arcade side-scrolling fighting game. Pick between, Iron man, Captain America, Hawkeye, or Vision as your favorite starting hero.The Red Skull has assembled an army of supervillains and other henchmen in a plot to take over the world. Along with battling generic enemies, players also face Klaw, the Living Laser, Whirlwind, The Sentinels, Wizard, the Grim Reaper, the Mandarin, The Juggernaut, Ultron, the assassin Crossbones, and finally the Red Skull himself. *Updated with 2 player mode available. Play together with your friend to defeat villains. As Always, Have Fun. Only use keyboard to play. Pretend your keyboard is the a game controller. Click on the “controls” button at the bottom of game to see the controller-to-keyboard mapping. Player 2 uses the NumPad. Please make sure you NumPad is unlocked.